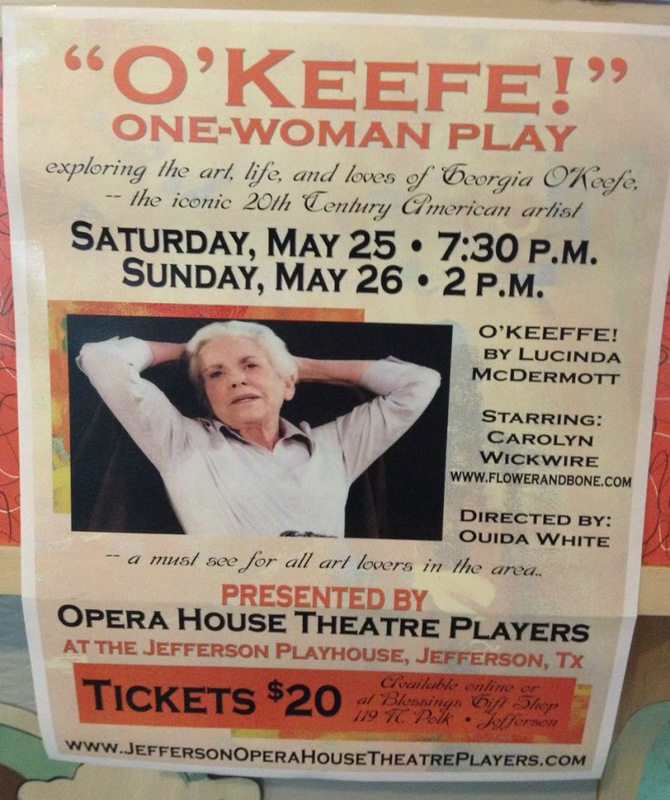 The Opera House Theatre Players brings this traveling show to Jefferson for one weekend only, Saturday May 25 at 7:30PM and Sunday May 26 at 2:00PM at the Jefferson Playhouse. Georgia O’Keeffe portrayed by Carolyn Wickwire. Ms. O’Keeffe has been recognized as the Mother of American Modernism. Painting large-format paintings of enlarged blossoms, presenting them close up as if seen through a magnifying lens. Later she painted many things from her beloved ‘Faraway’, New Mexico. 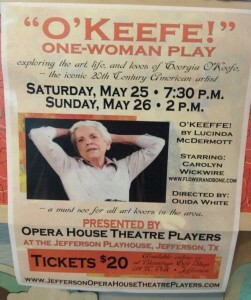 The play is one-woman; Carolyn Wickwire as Georgia O’Keeffe recreating the loves, art and life of this iconic 20th century artist. Tickets are $20 per person; they can be pre-purchased at Blessings Gift Shop on Polk St or by calling 903-665-3895 or 903-665-2310.